Characters: The usual characters, Ed, Al, Whinry, Roy and Riza (even though the colonel and his lieutenants screen time is limited) were obviously pretty great, so I feel no need to go into their role in detail. Julia Crichton was by far the best character, fighting for what she thinks is right, and even though her view may be naive, that works, she is after all only sixteen. Her blind desire to rip Table City from Creta, and restore it to the exploited people of Milos is identifiable; her willingness to do whatever it takes, even put her own life in danger. I’m sure each and every one of us has felt such a deep desire for something that it blinded us to reason and cognitive thought. So Julia was a refreshingly realistic character, who was the movies salvation. Really, the other characters were nothing special, but due to spoiler reasons I can’t really delve into their makeup. Sound: It was fine, it did its job as background music, but unlike in the Brotherhood series, it didn’t stand out as really heightening the mood, making me sad when I was supposed to be, or getting my heart racing when it was supposed to be. Nothing really stood out. It was perfectly adequate. Considering how perfectly the background music fit into the Brotherhood series, I was expecting something much more then “adequate” from the movie. The voice acting on the other hand was far more then “adequate”, it really was superb! Bravo Vic Mignogna, you bring so much energy to Edward, I can’t imagine someone voicing him better. Plot: The plot was complicated, to say the least. Full of twists and turns, some of which were obscenely obvious, others I did not see coming, but I really can’t elaborate more because we are getting into spoiler territory. The plot was not only complicated due to twists and turns, but also the moral and ethical dilemma’s these characters faced. Is it ever worth using a philosophers stone? Are there just reason’s to seek to rule the world? How far would you go for family? What does the word “home” truly mean? These questions make for a pretty intense movie. That being said, I feel that certain plot aspects could have been pulled off a bit better, but again, I can’t really expand because of spoilers. You’re just going to have to watch the film! Overall: As much as it hurts my soul to say this, the movie was a bit of a disappointment. Although, I must preface this with the fact that I went in with extremely high expectations, I loved Brotherhood, and it is most definitely in my top three anime. So I went into this film expecting nothing less then perfection, and perfect it was not. Though if you are a fan of the FMA franchise, please, I implore you to see this film. It is action packed, sprinkled with some genuine laugh out loud moments. So if you at all enjoy FMA, this is the film for you, though try to slightly lower your expectations, this may make it more enjoyable. 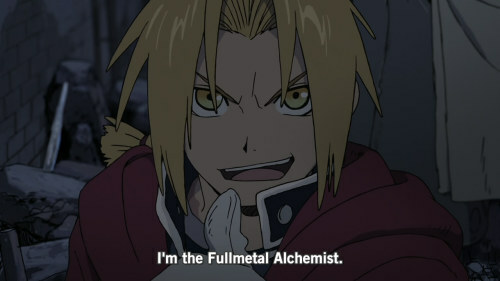 FMA Movie, check this out!